The second week in January we planned a trip to see the Alhambra in Granada, Fort Bravo near the town of Tabernas and the Mezquita in Córdoba. Along the way we discovered cave homes in Guadix and a complete 14th C. castle in Almodóvar that was open for tours. It was a four hour trip on secondary roads to get to the city of Granada. It sits in a large fertile plain overseen by a huge Moorish complex on the ridge. This is the Alhambra, a complex of castles, forts and gardens that are in very good shape. We arrived in the middle of the afternoon and tried to get to our chosen hotel on a plaza in the old town. The GPS had figured out a route, only it wanted me to turn onto a street that was for "authorized" vehicles only and had a post in the middle of the road to prevent others from using it. (The post is a metal post about 8" in diameter and 2' high and raises and lowers by a remote control carried by "authorized" drivers. We have seen these is several places in Europe.) After trying several other routes, including driving down a road turned into pedestrian mall, we were back at the no entry corner. This time I followed a scooter around the post and drove the two blocks to the hotel, which was on an approved road (but I couldn't find my way to it). This hotel had a garage nearby that gave security to the bike, was in old town and relatively cheap, all features that we wanted. That afternoon we wandered around through the narrow lanes and streets of the old town and toured the cathedral. The cathedral was all white and gold inside and had windows up high giving it a very light and airy atmosphere, unusual in Catholic Cathedrals. 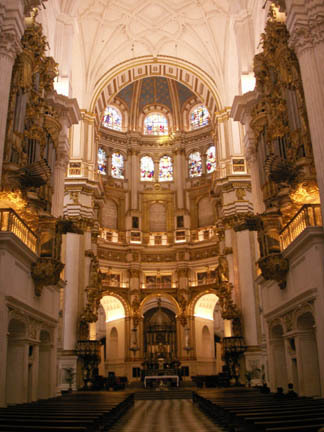 The altar is at the far end and the two large gold structures on the walls are the pipe organ tubes. The seating extends for at least a hundred feet behind where I took the picture from. The outside picture shows how huge the cathedral is. The picture was taken from the Moorish fort, the Alcazaba. We wandered around until after dark and then had dinner about 8:00, early by Spanish standards. After dinner we wandered some more and then had wine and tapas at a bar near the hotel. The next morning we got up early and were at the bus stop for the Alhambra bus at 8:00 in the morning. There are only 6300 tickets sold for any one day and 75% are sold over the internet in advance, we wanted to be sure and get two of the remaining tickets so we were there before they opened at 8:30. Later in the day there were several tour groups wandering around, mostly Orientals. By being that early we saw most things before they were over-run by the crowds. 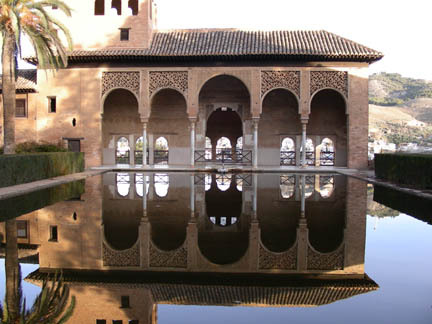 The Alhambra is a complex of buildings and gardens built over several centuries along a ridge above a wide river valley. Like much of Europe's monuments it was falling into disrepair and was a source of building material for the town. That is until Washington Irving, the American writer, moved into empty rooms and wrote his Tales of the Alhambra. This sparked interest in it and tourists started coming. 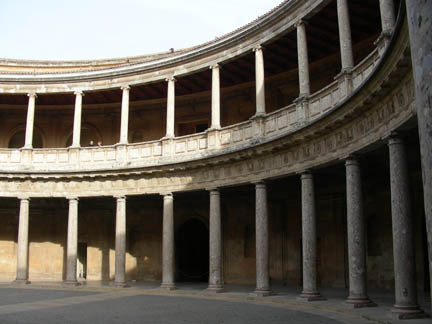 The Spaniards made it a national monument and started to restore it. The ridge points east and the buildings on the point of the ridge are called the Alcazaba. This is the Moorish fort with high walls, towers and barracks for soldiers. Next, to the east, is an open area with a wall and gate, then more open area and then along the north side of the ridge are the royal Moorish palaces, the Palacios Nazaries. 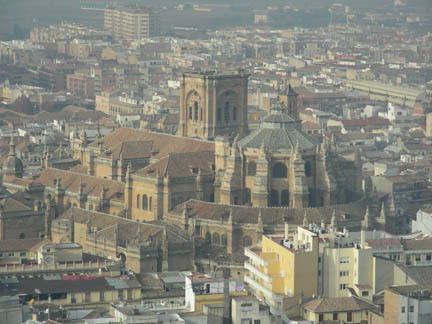 Right in the center of the ridge is the palace of the Christian king Carlos V who was the grandson of Ferdinand and Isabel (of Columbus's fame). He wanted to live where previous kings had lived and tore down a large part of the Moorish palaces and built a monstrosity right in the middle. To the east of this was a park and then the vegetable gardens. 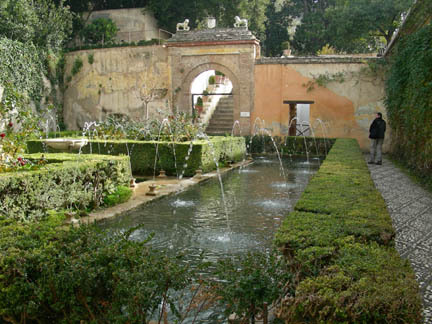 Lastly to the northeast against a large hill was an extensive garden, called the Generalife, built around a palace that was the private living quarters of the royalty. The main palaces were for receiving dignitaries and official business, this area was private. The whole complex and all it's fountains was fed by a river that was diverted 8 kilometers away and brought to the Alhambra through canals and aqueducts. The Alcazaba fort looking east from the tower on the point of the ridge. The maze like wall bases are the remains of the soldiers quarters. The outside picture of the cathedral was taken from here facing the other way. 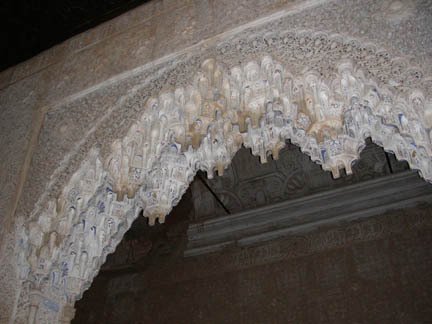 All this is set off with fine Moorish art carved into almost every surface. Moorish art is always geometric or quotes from the Koran (their Holy book). The Koran forbids images of animals or people in building decorations. There is a large use of tiles and relief carvings as shown in this doorway arch. 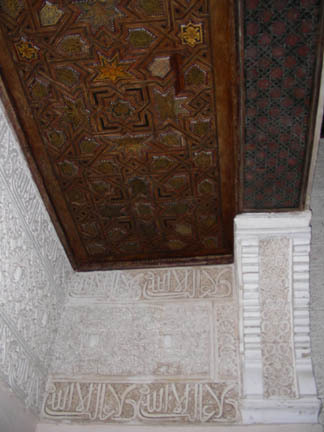 The ceiling and wall on the right are heavily carved. The Arabic phrase, best seen on the at the bottom of the right picture where it is repeated twice, is Wa-la ghaliba illa-Llah and translates as "There is no Conqueror but God". 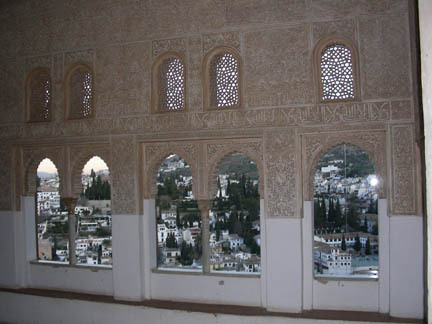 It is repeated all over the Moorish palaces endlessly as it is between the windows in the third picture. Set right in the middle of the whole complex is the palace started by Carlos V in 1526 but not finished. 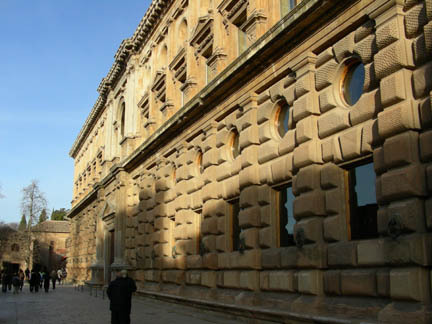 It is a huge square with a big circular courtyard right in the center surrounded by a pillared gallery. 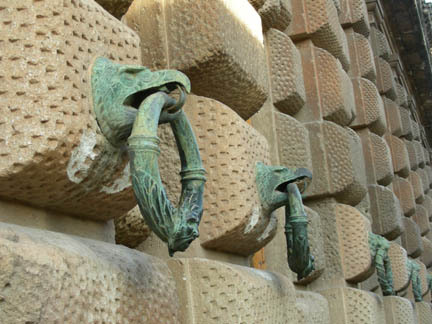 On the outside, between the windows, are huge bronze rings held by lion and eagle heads. I have no idea what they could have been used for, they're too high and big to tie your horse to. The Generalife was a huge garden complex with a palace in it. It could be seen from many parts of the Alcazaba and Palacios. 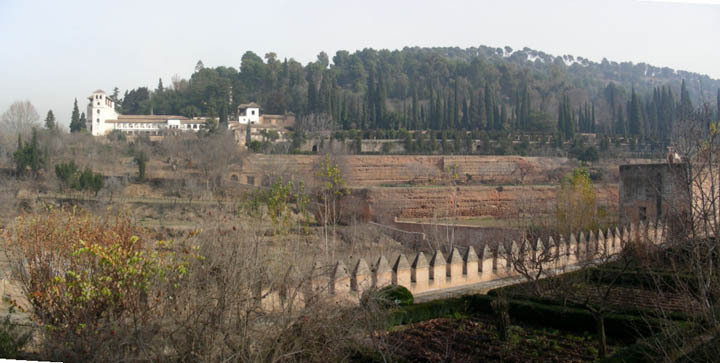 In the foreground are the vegetable gardens, across the wall the creek and then the terraced gardens and castle of the Generalife. The castle is on the left and a garden of cypress and water features is on the right on the same level. The cypress gardens had many fountains and reflecting pools. 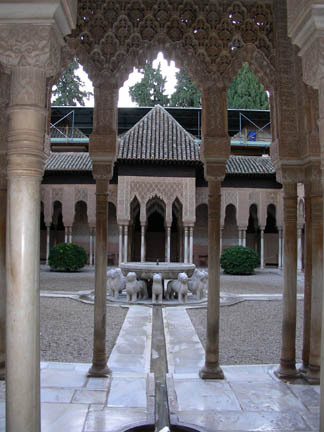 The one on the left is the Patio de la Sultana where Sultana Zoraya is suspected to have met her lover Hamet, the chief of another branch of Moors. 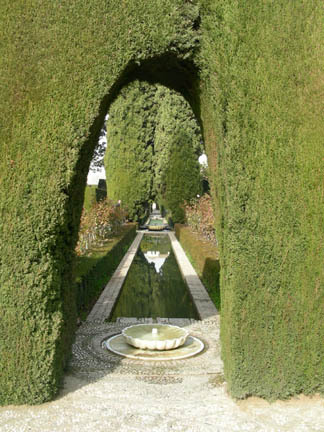 It is a large area (think football field) of sculpted cypresses with archways, paths, pools and cu-de-sacs. And as the right-hand picture shows, the castle had its share of ponds and gardens too. We spent eight hours touring everything and then walked back down the hill to town for a dinner and another glass of wine at the bar near our hotel. The next morning we collected the bike and headed on eastwards towards Spanish Hollywood known as Fort Bravo.